Received: June 19, 2018; Revised: September 27, 2018; Accepted: September 27, 2018; Published online: November 21, 2018. Cell therapeutic agents for treating degenerative brain diseases using neural stem cells are actively being developed. However, few systems have been developed to monitor in real time whether the transplanted neural stem cells are actually differentiated into neurons. Therefore, it is necessary to develop a technology capable of specifically monitoring neuronal differentiation in vivo. In this study, we established a system that expresses cell membrane-targeting red fluorescent protein under control of the Synapsin promoter in order to specifically monitor differentiation from neural stem cells into neurons. In order to overcome the weak expression level of the tissue-specific promoter system, the partial 5′ UTR sequence of Creb was added for efficient expression of the cell surface-specific antigen. 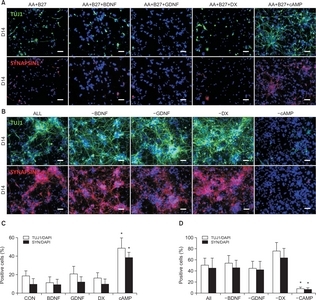 This system was able to track functional neuronal differentiation of neural stem cells transplanted in vivo, which will help improve stem cell therapies. Neural precursors isolated from the embryonic central nervous system (CNS) can be expanded in vitro and be differentiated into various neuronal and glial subtypes in vitro and in vivo (Davis and Temple, 1994; Brustle et al., 1997). Studies on CNS precursor cells provide a valuable tool for probing brain development and for developing a renewable source of specialized neurons for cell replacement strategies (Park et al., 2006). Many issues still must be resolved before applying stem cell therapy in the clinic, including low cell viability, difficulty of tracking stem cell differentiation, and low cell engraftment after transplantation (Arvidsson et al., 2002; Yamashita et al., 2006). To address the stem cell differentiation tracking problem, we developed a Synapsin reporter system to enhance the identification, sorting, and tracking of mature neurons. SYNAPSIN is a family of neuron-specific phosphoproteins that selectively bind to small synaptic vesicles (Thiel et al., 1991), and SYNAPSIN expression is one of the most frequently used markers for confirming mature neurons (Kugler et al., 2001). Previous studies have reported the use of a Synapsin promoter to drive the expression of a reporter gene from the predicted Synapsin promoter or by fusion with a reporter gene (Kugler et al., 2003). To date, many studies have been carried out to detect the transplanted cells themselves after neural precursor cell transplantation; however, no method has been reported to observe neuronal differentiation in vivo. In this study, we aimed to establish a system to track neuronal differentiation in vivo. Animals were housed and treated according to the guidelines of the Institutional Animal Care and Use Committee (IA-CUC-2016-0084A) of Hanyang University, Korea. Cultures of mouse neural precursor cells (NPCs) derived from mouse embryonic brains were performed as described previously (Park et al., 2008) with some modifications. NPCs were obtained from the cortex of Imprinting Control Region (ICR) mice at embryonic day 12 (DaeHan BioLink, Seoul, Korea). Mouse NPCs dissociated from the cortex tissue were cultured at 20,000 cells/cm2 on a dish pre-coated with 15 μg/mL poly-l-ornithine (Sigma-Aldrich, St. Louis, MO, USA) and 1 μg/mL fibronectin (Sigma-Aldrich). For proliferation, the mouse NPCs were incubated in proliferation medium comprising N2 medium (DMEM/F12, 4.4 μM insulin, 100 mg/L transferrin, 30 nM selenite, 0.6 μM putrescine, 20 nM progesterone, 200 mM L-glutamine, 8.6 mM D(+) glucose, 20 mM NaHCO3 [Invitrogen, Carlsbad, CA, USA]) supplemented with 20 ng/mL basic fibroblast growth factor (bFGF; R&D Systems, Minneapolis, MN, USA), 20 ng/mL epidermal growth factor (EGF; R&D Systems), and B-27 Supplement without Vitamin A (Invitrogen) at 37°C, 5% CO2. For differentiation, the NPCs were incubated in differentiation medium, comprising N2 medium supplemented with 0.2 mM ascorbic acid (AA; Sigma-Aldrich), 20 ng/mL brain-derived neurotrophic factor (BDNF; PeproTech, Rocky Hill, NJ, USA), 20 ng/mL glial cell line derived neurotrophic factor (GDNF; Peprotech), 250 μg/mL dibutyryl-cyclic AMP (cAMP; Sigma-Aldrich), and/or B-27 Supplement (Invitrogen) at 37°C in a 5% CO2 incubator. Medium was changed every other day and mitogens were added daily. pLVX-CherryPicker2 vector (Clontech, Mountain View, CA, USA) was used for constructing plasmid backbones. CMV IE promoter+multiple cloning site+internal ribosome entry site of pLVX-CherryPicker2 vector were replaced by the following four types. 1) S; Human Synapsin promoter (pSYN, from Gen-Bank: AH006533.2, ctagactgcagagggccctgcgtatgagtgcaagtgg gttttaggaccaggatgaggcggggtgggggtgcctacctgacgaccgacccc gacccactggacaagcacccaacccccattccccaaattgcgcatcccctat cagagagggggaggggaaacaggatgcggcgaggcgcgtgcgcactgc cagcttcagcaccgcggacagtgccttcgcccccgcctggcggcgcgcgc caccgccgcctcagcactgaaggcgcgctgacgtcactcgccggtcccccg caaactccccttcccggccaccttggtcgcgtccgcgccgccgccggcccagc cggaccgcaccacgcgaggcgcgagataggggggcacgggcgcgaccatct gcgctgcggcgccggcgactcagcgctgcctcagtctgcggtgggcagcggag gagtcgtgtcgtgcctgagagcgcagtcggga), 2) S5; pSYN+partial 5′ untranslated region of rat cAMP response element-binding protein gene (rCreb 5′ UTR, from NCBI Reference Sequence: XM_017596652.1, cggctgggagaagccgagtgttggtgagtgacgcggcggaggtgtagtttgacgcggtgtgttacgtgggggagagaataaaactccagcgagatccgggccgcgaacgaaagcagtgacggaggagcttgtaccaccggtgactag) (Park et al., 2012), 3) cS; cytomegalovirus enhancer (pCMVE IE, tattaatagtaatcaattacggggtcattagttcatagcccatatatggagttccg cgttacataacttacggtaaatggcccgcctggctgaccgcccaacgaccccc gcccattgacgtcaataatgacgtatgttcccatagtaacgccaatagggactttc cattgacgtcaatgggtggagtatttacggtaaactgcccacttggcagtacat caagtgtatcatatgccaagtacgccccctattgacgtcaatgacggtaaatggccc gcctggcattatgcccagtacatgaccttatgggactttcctacttggcagtacatc tacgtattagtcatcgctatta) and 4) cS5; pCMVE IE+pSYN+Creb 5′ UTR), respectively. Each sequence was amplified using High fidelity taq polymerase (Invitrogen) and cloned into pGEM T-Easy (Promega, Madison, WI). pLVX-CherryPicker2 lentiviral vectors harboring these sequences were generated by inserting the appropriate restriction enzyme fragments derived from each of the pGEM T-Easy intermediates. As a result, the vectors CherryPicker-LV2S, CherryPicker-LV2S5, CherryPicker-LV2cS, and CherryPicker-LV2cS5 were constructed. The lentiviruses were produced from 293T cells with packaging plasmids (pLP1, pLP2, pLP-VSVG, Clontech). Transfection was performed by reacting the lentiviral plasmids and Lipofectamine2000 reagent (Invitrogen). The supernatants containing lentiviral particles were harvested after 24 h of transfection. The viral supernatants were concentrated using ultracentrifugation (Optima XL-I, Beckmen, CA, USA). The concentrated supernatants were transduced to mouse NPCs in the presence of polybrene (1 μg/mL, hexadimethrine bromide: Sigma-Aldrich) for 24 h in the proliferation medium. Cultured cells were fixed using 4% paraformaldehyde (Sigma-Aldrich), and the fixed cells were blocked using 0.1% bovine serum albumin (BSA)/phosphate-buffered saline (PBS), 10% normal goat serum (NGS; Pel-Freez, Rogers, AR, USA), and 0.3% Triton X 100 (Sigma-Aldrich) for 1 h. The blocked cells were incubated with the following primary antibodies at 4°C overnight: rabbit anti-TUJ1 (1:2000, Covance, Richmond, CA, USA), rabbit anti-red fluorescent protein (RFP; 1:500, Rockland, Limerick, PA, USA), mouse anti-SYNAP-SIN1 (1:500, BD Biosciences, San Jose, CA, USA). The next day, the cells were incubated with Alexa 488-(Invitrogen), Rhodamine-, or Cy3- (Vector Laboratories, Burlingame, CA, USA) conjugated secondary antibodies. Cells were mounted in VECTASHIELD with 4′,6-diamidino-2-phenylindole (DAPI; Vector Laboratories) and observed and photographed under a fluorescent microscope (LEICA Microsystem, Wetzler, Germany). The adult ICR mice (6-wk old; Orient, Seongnam, Korea) were anesthetized with ketamine (100 mg/kg; Huons, Gyeonggi, Korea) and xylazine (10 mg/kg; Bayer Korea, Seoul, Korea) by intraperitoneal injection. The mice received an intracortical and intrastriatal injection of mouse NPCs (5.0×105 cells/5 μL volume, 0.01 μL/s infusion rate) using stereotaxic coordinates (cortex: AP +0.5 mm from bregma; ML –1.7 mm from bregma; DV –1.5 mm from dura and striatum: AP +0.5 mm from bregma; ML –1.7 mm from bregma; DV –3.5 mm from dura). Body temperature was maintained at 37°C in a heating chamber during the recovery period. Animals were sacrificed under ketamine (100 mg/kg; i.p.) and xylazine (10 mg/kg; i.p.) anesthesia and given an intracardial perfusion of 4% paraformaldehyde, then the brains were harvested and cryosectioned with a slice thickness of 16 μm. Individual sections were stained using rabbit anti-red fluorescent protein (RFP; 1:500, Rockland, Limerick, PA, USA). The sections were incubated with Alexa Fluor R 594 (1:400, Invitrogen), secondary antibodies, then covered with Vectashield R mounting medium with DAPI. The stained sections were then assessed by confocal imaging (LSM700, Zeiss, Gottingen, Germany). Cell counting was conducted in 5–10 microscopic fields per well, with three wells per experimental condition. All experiments were conducted in triplicate. Data are expressed as the mean ± SEM. When more than two groups were compared, a paired t-test was performed using SigmaPlot for windows, version 10.0 (Systat Software GmbH, Erkrath, Germany). Using previously developed mouse primary NPCs isolation (Park et al., 2008) and differentiation (Chambers et al., 2009) protocols, the critical role of various cytokines (AA, BDNF, GDNF, cAMP, B-27 supplement, and doxycycline) during NPC differentiation into neurons was established. Consequently, we tested a more efficient differentiation cytokine mixture and determined the key cytokine(s) contributing to differentiation. Neuronal differentiation was conducted in NPCs cultured in conditioned medium supplemented with AA and B-27 supplement. To determine the key cytokine, NPCs were also differentiated in media containing individual cytokines. Mouse NPCs were cultured in the differentiation medium for 14 days and identified with immunofluorescence analysis (Fig. 1A). Neurons were monitored according to the expression of TUJ1 and SYNAPSIN1, an early neuronal marker and marker of differentiated neurons, respectively. Only cAMP treatment greatly increased the efficiency of neuronal differentiation to >50% of all cells, compared with a rate of <20% TUJ1+ cells detected when the other individual cytokines were used alone (Fig. 1C). In addition, an efficient differentiation cytokine mixture was determined using various cytokines while eliminating each cytokine one at a time. As a result, the number of neurons increased upon treatment with various cytokines (Fig. 1B). However, the removal of cAMP decreased the efficiency of neuron differentiation with <10% TUJ1+ of all cells, compared with >50% TUJ1+ cells when all cytokines were used. In addition, we found the cytokine mixture lacking doxycycline showed greatly increased differentiation efficiency with >75% neurons of all cells compared with >50% TUJ1+ cells when all cytokines were used (Fig. 1D). These results showed that an efficient differentiation cytokine mixture and cAMP play a critical role in promoting neuronal differentiation in NPC culture. Previous studies have reported the use of a Synapsin promoter as a neuronal marker. We developed several vectors for neuron-specific identification based on pLVX-CherryPicker2, a self-inactivating lentivirus derived from HIV-1. We replaced the CMV IE promoter region of pLVX-CherryPicker2 to the human Synapsin promoter. SYNAPSIN1 is a family of neuron-specific phosphoproteins that selectively bind to small synaptic vesicles. In addition, we enhanced Synapsin promoter function for specific expression using partial 5′ UTR region of Creb and a CMV enhancer. Four constructs were created based on the expression of a membrane-targeted RFP (CHERRYPICKER) under the control of the Synapsin promoter (pSYN-RFP). First, a construct was created by inserting the Synapsin promoter in front of the CherryPicker gene (CherryPicker-LV2S). Second, the pSYN-RFP construct was created by inserting partial 5′ UTR region of Creb (CherryPicker-LV2S5). Third, the pSYN-RFP construct was created by inserting the pCMV enhancer (CherryPicker-LV2cS). Finally, the pSYN-RFP construct was created by inserting partial 5′ UTR region of Creb and the pCMV enhancer (CherryPicker-LV2cS5, Fig. 2A). Mouse NPCs were transduced with the four pSYN-RFP construct plasmids by lentivirus, respectively, differentiated to neurons for 14 days, and identified with immunofluorescence analysis. All four constructs of pSYN-RFP mouse NPCs were positive for RFP, indicating that the pSYN-RFP reporter system was working properly. However, pSYN-RFP showed significantly weaker gene expression in differentiated mouse NPCs compared with expression in proliferating NPCs. Consequently, gene expression increased according to the concentration of lentivirus using successive rounds of ultracentrifugation with high-titer viral preparations (Ichim and Wells, 2011). Among the four constructs, CherryPicker-LV2S5 showed a particularly high titer and specific expression. When NPCs were differentiated into neurons for 14 days with CherryPicker-LV2S5, immunofluorescence analysis showed no RFP expression at day 0 (prior to differentiation); however, beginning at day 3, several cells began to express RFP, and its expression level increased as differentiation progressed. 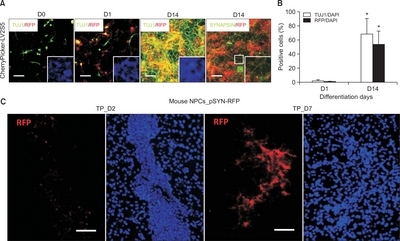 Interestingly, the RFP-positive cells in differentiating NPCs mostly overlapped with SYNAPSIN1 and TUJ1+ cells (Fig. 3A, 3B). At 1 day of differentiation, there were <5% RFP+ cells among total cells, which increased to >50% RFP+ cells at 14 days (Fig. 2B). The CherryPicker-LV2cS5 transduced NPCs expressed a high titer of RFP; however, their morphology was immature due to the non-specific driving force of the pCMV enhancer. Therefore, we selected the CherryPicker-LV2S5 construct for a neuronal differentiation-specific RFP expression vector. We identified that the pSYN-RFP reporter system was working properly in vivo by transplanting pSYN-RFP NPCs into a mouse model. Immunofluorescence analysis showed RFP expression in xenografts at 2 days and 7 days after transplantation (Fig. 3C). Similar to in vitro expression patterns, in vivo transplanted NPCs did not express RFP at day 2; however, RFP was expressed at day 7 of transplantation. A variety of stem cell therapies have been applied in the clinic. However, it is difficult to evaluate the role of transplanted stem cells because it is difficult to determine if the stem cells injected into patients function in vivo. In the case of stem cell therapy for degenerative brain diseases, it has been reported that the transplanting committed neural precursor cells is more effective than transplanting fully differentiated neuronal cells (Park et al., 2005). In the case of transplanting neural precursor cells, the transplanted neural precursor cells are observed through tissue staining at the expense of the transplanted animals in order to confirm the differentiation into functional neurons. When NPCs transfected with magnetic nanoparticles are transplanted, the distribution of the transplanted NPCs in vivo can be observed by magnetic resonance imaging (MRI). However, whether or not the transplanted neural progenitor cells have been differentiated into functional neurons has not yet been reported by MRI observation. This may be due to the absence of cell surface antigens that can specifically track differentiated neurons. In this study, we established a platform for monitoring neurons that specifically express cell surface antigens in differentiated neurons. First, the most effective differentiation cytokine mixture was determined during the differentiation of NPCs into neurons. The most effective combination of cytokines for differentiation was determined as AA, BDNF, GDNF, cAMP, and B-27 supplements, and TUJ1 and SYNAPSIN expression were used as neuronal differentiation markers. We also found that cAMP is the most important factor for inducing neurons. This is consistent with reports that the transcription factor CREB is involved in several aspects of neuronal development (Giachino et al., 2005). In addition, doxycycline directly inhibits the PI3K-AKT pathway, which is associated with cell survival but inhibits differentiation (Singh et al., 2012; Chang et al., 2014), and since doxycycline interferes with the neuronal differentiation of NPCs, it was excluded from the cytokine combination. Next, the CherryPicker gene used in this construct is a fusion protein composed of the fluorescent protein mCHERRY and the transferrin receptor membrane anchor domain (Shaner et al., 2004). As a result, CHERRYPICKER protein is expressed on the cell surface. CHERRYPICKER has been applied to overcome the limitations of conventional in vivo transplanted stem cell detection systems using MRI because it acts as a surface antigen for the anti-RFP antibody as a targeting tool for neurons. This protein enables the in vivo monitoring of neurons by combining Fe3O4 with this antibody (Sohn et al., 2015). In addition, the SYNAPSIN protein is a differentiation-specific protein that is expressed when NPCs differentiate into neurons. The SYNAPSIN protein begins to be expressed 3 to 5 days after neural differentiation and is expressed thereafter (Kugler et al., 2001). By applying the CHERRYPICKER protein to the SYNAPSIN protein expression pattern, the CHERRYPICKER protein can be specifically expressed on the neuronal surface. Therefore, we have established a system in which CHERRYPICKER protein expression is induced by the Synapsin promoter. In the case of tissue-specific promoters, it is known that the protein expression intensity is weak. The Synapsin promoter vector, which is generally used, has been used in combination with the CMV enhancer sequence to enhance the expression potential of the Synapsin promoter. The CMV enhancer can promote the strong expression of an exogene, but because it expresses the exogene in all cells, it has low specificity for the Synapsin promoter and the exogene can be expressed in cells other than neurons. In this study, we used a partial sequence of the 5′ UTR region of the Creb gene to increase exogene expression while maintaining the specificity of the Synapsin promoter. Four vectors were constructed by combining each sequence of the CMV enhancer, Synapsin promoter, and the 5′ UTR of Creb. As a result, the Synapsin promoter+5′ UTR of Creb construct (CherryPicker-LV2S5) was used to express the CHERRYPICKER protein specifically in neurons. 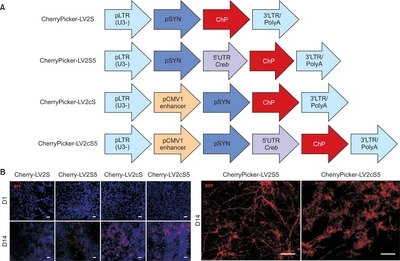 In vitro, CHERRYPICKER protein was not expressed during proliferation or at the early stage of neuronal differentiation but was expressed on the surface of neurons upon the progression of neuronal differentiation and was persistently expressed after 7 days of neuronal differentiation. NPCs transduced with CherryPicker-LV2S5 were transplanted into mouse striatum and stained 2 and 7 days after transplantation. Similar to the in vitro results, the expression of CHERRYPICKER protein was not observed on the second day of transplantation, but on the 7th day of transplantation, the CHERRYPICKER protein was fully expressed on neuronal surfaces. These results show that our system worked properly not only in vitro but also in vivo. This research was supported by a grant from the Korea Health Technology R & D Project of the Korea Health Industry Development Institute (KHIDI), funded by the Ministry of Health & Welfare, Republic of Korea (grant number: HI16C1013). Fig. 2. Identification of the pSYN-RFP reporter system of neural stem cells. (A) Schematic of the construction of the human Synapsin promoter-driven CherryPicker reporter constructs. (B) Representative images of neuronal cultures transduced with four lentiviral vectors of hSYN-RFP and immunostained with RFP; mouse NPCs were differentiated into neurons for 1 and 14 days. The RFP protein transduced by the CherryPicker-LV2S5 lentivirus shows the most mature neuronal morphology. Scale bar, 50 μm. Arvidsson, A, Collin, T, Kirik, D, Kokaia, Z, and Lindvall, O (2002). Neuronal replacement from endogenous precursors in the adult brain after stroke.. Nat. Med. 8, 963-970. Brustle, O, Spiro, AC, Karram, K, Choudhary, K, Okabe, S, and McKay, RD (1997). In vitro-generated neural precursors participate in mammalian brain development.. Proc. Natl. Acad. Sci. U.S.A. 94, 14809-14814. Chambers, SM, Fasano, CA, Papapetrou, EP, Tomishima, M, Sadelain, M, and Studer, L (2009). Highly efficient neural conversion of human ES and iPS cells by dual inhibition of SMAD signaling.. Nat. Biotechnol. 27, 275-280. Chang, MY, Rhee, YH, Yi, SH, Lee, SJ, Kim, RK, Kim, H, Park, CH, and Lee, SH (2014). Doxycycline enhances survival and self-renewal of human pluripotent stem cells.. Stem cell Reports. 3, 353-364. Davis, AA, and Temple, S (1994). A self-renewing multipotential stem cell in embryonic rat cerebral cortex.. Nature. 372, 263-266. Giachino, C, De Marchis, S, Giampietro, C, Parlato, R, Perroteau, I, Schutz, G, Fasolo, A, and Peretto, P (2005). cAMP response element-binding protein regulates differentiation and survival of new-born neurons in the olfactory bulb.. J. Neurosci. 25, 10105-10118. Ichim, CV, and Wells, RA (2011). Generation of high-titer viral preparations by concentration using successive rounds of ultracentrifugation.. J. Transl. Med. 9, 137. Kugler, S, Meyn, L, Holzmuller, H, Gerhardt, E, Isenmann, S, Schulz, JB, and Bahr, M (2001). Neuron-specific expression of therapeutic proteins: evaluation of different cellular promoters in recombinant adenoviral vectors.. Mol. Cell. Neurosci. 17, 78-96. Kugler, S, Kilic, E, and Bahr, M (2003). Human synapsin 1 gene promoter confers highly neuron-specific long-term transgene expression from an adenoviral vector in the adult rat brain depending on the transduced area.. Gene Ther. 10, 337-347. Park, CH, Minn, YK, Lee, JY, Choi, DH, Chang, MY, Shim, JW, Ko, JY, Koh, HC, Kang, MJ, Kang, JS, Rhie, DJ, Lee, YS, Son, H, Moon, SY, Kim, KS, and Lee, SH (2005). In vitro and in vivo analyses of human embryonic stem cell-derived dopamine neurons.. J. Neurochem. 92, 1265-1276. Park, CH, Kang, JS, Shin, YH, Chang, MY, Chung, S, Koh, HC, Zhu, MH, Oh, SB, Lee, YS, Panagiotakos, G, Tabar, V, Studer, L, and Lee, SH (2006). Acquisition of in vitro and in vivo functionality of Nurr1-induced dopamine neurons.. FASEB J. 20, 2553-2555. Park, CH, Kang, JS, Yoon, EH, Shim, JW, Suh-Kim, H, and Lee, SH (2008). Proneural bHLH neurogenin 2 differentially regulates Nurr1-induced dopamine neuron differentiation in rat and mouse neural precursor cells in vitro.. FEBS Lett. 582, 537-542. Park, CH, Lim, MS, Rhee, YH, Yi, SH, Kim, BK, Shim, JW, Kim, YH, Jung, SJ, and Lee, SH (2012). In vitro generation of mature dopamine neurons by decreasing and delaying the expression of exogenous Nurr1.. Development. 139, 2447-2451. Shaner, NC, Campbell, RE, Steinbach, PA, Giepmans, BN, Palmer, AE, and Tsien, RY (2004). Improved monomeric red, orange and yellow fluorescent proteins derived from Discosoma sp. red fluorescent protein.. Nat. Biotechnol. 22, 1567-1572. Singh, AM, Reynolds, D, Cliff, T, Ohtsuka, S, Mattheyses, AL, Sun, Y, Menendez, L, Kulik, M, and Dalton, S (2012). Signaling network crosstalk in human pluripotent cells: a Smad2/3-regulated switch that controls the balance between self-renewal and differentiation.. Cell Stem Cell. 10, 312-326. Sohn, CH, Park, SP, Choi, SH, Park, SH, Kim, S, Xu, L, Kim, SH, Hur, JA, Choi, J, and Choi, TH (2015). MRI molecular imaging using GLUT1 antibody-Fe3O4 nanoparticles in the hemangioma animal model for differentiating infantile hemangioma from vascular malformation.. Nanomedicine. 11, 127-135. Thiel, G, Greengard, P, and Sudhof, TC (1991). Characterization of tissue-specific transcription by the human synapsin I gene promoter.. Proc. Natl. Acad. Sci. U.S.A. 88, 3431-3435. Yamashita, T, Ninomiya, M, Hernandez Acosta, P, Garcia-Verdugo, JM, Sunabori, T, Sakaguchi, M, Adachi, K, Kojima, T, Hirota, Y, Kawase, T, Araki, N, Abe, K, Okano, H, and Sawamoto, K (2006). Subventricular zone-derived neuroblasts migrate and differentiate into mature neurons in the post-stroke adult striatum.. J. Neurosci. 26, 6627-6636.